This MOU paves the way for sport hunting of grizzly bears in this large delisted population. This splits the “discretionary” mortality (surplus) bears between the three states. It might be meaningless because there has been no surplus of late. Instead, the grizzly will possibly be put back on the threatened species list in the Greater Yellowstone. It depends on how many more bears are killed this year. On the other hand, if accidental and illegal deaths decline, this could be meaningful. This has been under the radar for me. Below is the Memorandum of Understanding. This Memorandum of Understanding (MOU) is made and entered into by and between the Wyoming Game and Fish Commission (WGFD), Montana Fish, Wildlife and Parks (MFWP) and Idaho Department of Fish and Game (IDFG), collectively referred to as the Parties. The purpose of this MOU is to define the process by which the Parties will coordinate annual efforts to develop recommendations for the allocation of discretionary mortality, if any, of grizzly bears in the Greater Yellowstone Ecosystem for hunting consistent with the Final Grizzly Bear Conservation Strategy for the Greater Yellowstone Area and state management plans. The Final Conservation Strategy for Grizzly Bears in the Greater Yellowstone Area (GYA) establishes maximum allowable mortality limits for adult male and female, as well as dependent young, grizzly bears in the ecosystem to ensure the entire population maintains an overall growth rate equal to, or greater than zero. The Conservation Strategy incorporates state management plans that have different, but compatible, management objectives for the three state parties. Specifically, the state of Wyoming’s objective is to limit further expansion of the population in size and distribution per “Grizzly Bear Occupancy Management Following Delisting as a Threatened Species” (2005). The states of Idaho and Montana have an objective of allowing the population to expand into biologically suitable and socially acceptable areas. The Parties are committed to minimizing the amount of grizzly bear mortality due to conflict with human activities and defense of life and property or other management removals, collectively referred to as “non-discretionary mortality.” To the extent non-discretionary mortality can be held below the maximum allowable levels for the entire Yellowstone population, “discretionary mortality” outside of the National Parks could be available for allocation to other purposes, including translocation to other ecosystems, or hunter harvest as provided for in the Conservation Strategy, state plans, state laws, and regulations. Western Watersheds Project filed suit in Federal Court in Tucson, Arizona to stop a large domestic sheep trailing operation in desert bighorn sheep habitat on the Tonto National Forest. Domestic sheep are a source of respiratory illness that can devastate wild bighorn sheep herds. The U.S. Forest Service will cause a “die-off” of bighorn sheep by its decision to allow private livestock companies to drive 12,000 domestic sheep across the Tonto and Apache-Sitgreaves National Forests for a month, the Western Watersheds Project claims in Federal Court. 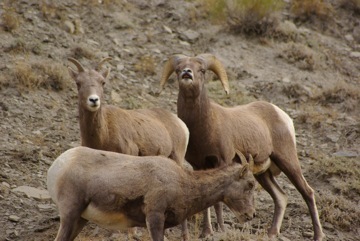 The environmental group says domestic sheep “carry disease that is fatal” to bighorn sheep and any contact between the species could devastate the bighorns.